Garrett Ace 250 has been released in the distant 2005… Why Garrett Ace 250 is still considered as one of the best metal detectors even after almost 15 years? I have been using Garrett Ace 250 metal detector since 2011, and though I do buy, use, and try out other metal detectors, I won’t give my Ace 250 away by no chance. It has a rather modest metal detector coil, no ground balance, no VDI, and also its signal is too loud and there’s no option to settle it… However, for some time past, I have started to assess metal detectors by the number of finds. It often happens that two people, one with Ace 250 and the other with some Minelab Equinox costing like ten Ace 250s, are researching the same place. Same place, two different metal detectors, and both have finds! So, what’s the point in buying more expensive metal detectors, then? Two years after I bought Garrett Ace 250, my first metal detector, I also purchased Minelab X-Terra 705, which I have eventually exchanged for Garrett AT Pro. All these were used extensively while prospecting, and still I have always had my Garrett ACE 250 in trunk. Ace 250 is the one most often bought by newbies who are not yet aware of the performance nuances of metal detectors. However, if one gets to choose from the catalogue features, say, Fisher F2 should be better than Ace 250. So, why this unexpensive metal detector for beginners became so cherished? This is the most widely used metal detector in world. It is not expensive, and compared to other models, its price is rather attractive (there are even cheaper, we’ll talk about them later). 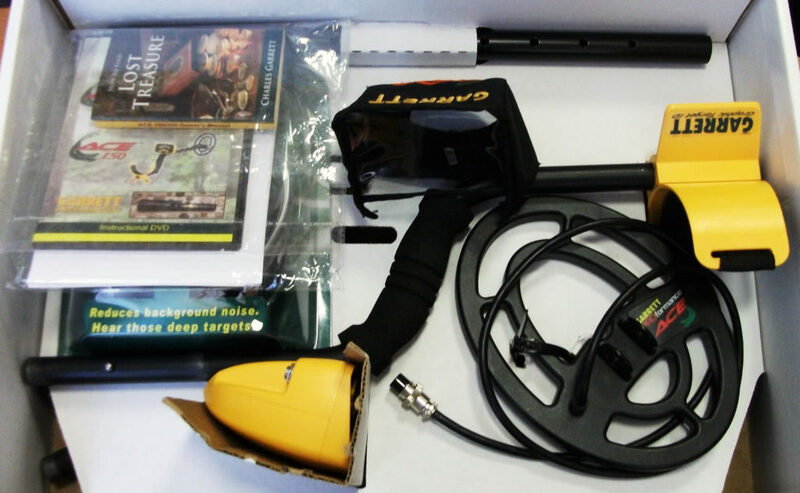 It is easy to use for metal detecting and one can handle its functions in 15 minutes. It is rather reliable and has several additional coils. It does bring finds. So, this is how it is represented on the market. Although it is a rare case, but here the sellers don’t lie. I have managed it pretty fast. The work book is less than twenty pages. Didn’t have to watch the video guide, as it was a no-brainer. During two years of active usage, Ace 250 stayed fully functional, despite the fact that either I used it, or I gave it to my friends, total newbies who have never had a metal detector but wanted to try. There are numerous coils, from huge to tiny, available on the market (while I have to admit that the prices might scare away a bit). And Garrett Ace250 always brings finds, even in the hands of a first-timer. Garrett Ace 250 is as easy as a pie – you turn it on, and off you go. Setting available are regulated sensitivity and research mode choice. Custom Mode. Custom Mode can be saved and is fully accessible after the tool is turned off and on (sending compliments to Fisher F2 that fails to save Custom settings after being turned off). The metal detector is easy to transport and to maintain before research: you only have to maintain the carrying bar, connect the electric cord, and you’re ready to go. It has a rather comfortable handle and elbow, and I mean it, since I have tried out numerous metal detectors and therefore I really appreciate simple and reliable options. With Ace 250 you won’t get tired fast, and will be able to research longer than with other models of detectors. What is also important is that you can actually use one hand, which is not the case with expensive tools (like Minelab X-Terra 305-705). So, we have simplicity, reliability, and efficiency in terms of finds. This is the best choice for a newbie. Garrett Ace 250 is not expensive, but there are metal detectors that are even cheaper. However, I see no point in metal detectors with no pinpoint (what a pun!) mode, that is, without “accurate object center identifier” function. I like researching for coins, but digging 4 square spit pits to get a coin is too much for me. It is better to turn on the pinpoint and identify where the object is, exactly. This is why I do not recommend different cheap models like Bounty Hunter and even Garrett Ace 150, a cheaper model in the Garrett line. So, Fisher F22 and Teknetics Eurotek PRO (only Eurotek PRO, simple model has no pinpoint function either) are still cheaper than Garrett Ace 250. However, I did not like Fisher F2… The discrimination really average, VDI which is no much boasted on by Fisher F2 functions inadequately, and the coil itself is poor (worse than in Garrett ACE 250). We have already discussed numerous advantages of the tool, but what about its disadvantages? For sure, there are some. But, I have bought my Garrett Ace 250 many years ago, and I have never been sorry about that. It is simple, reliable, and it brings finds. Obviously, it does have flaws, as any other metal detector. 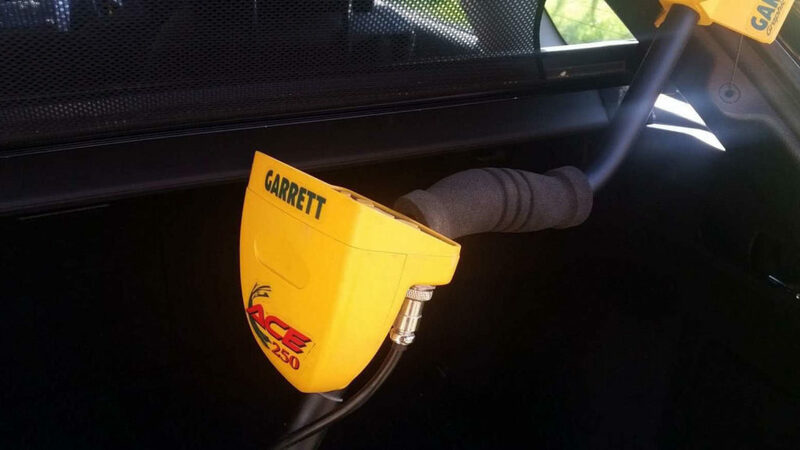 Garrett Ace 250 has a rather fragile elbow which is easy to break, if you bump it or it gets excessive pressure during transportation. However, the most frequent case is using it with larger coils (this is the most essential problem with the big coils). Don’t waste your time of repairing the broken elbow, it will fail again. So you should either make one for yourself, say, of a plastic water-pipe, or buy a new one. Original elbow is a bit costly, but there are plenty of Chinese alternatives. Original coil PROformance 6.5 is rather poorly functional in terms of depth of detection, has a small scanning area (with a cool pinpoint, though, stable at full sensitivity). To increase the depth of detection for Garrett Ace 250, its regular coil can be changed, say, for a bigger one DD type. It will increase the depth of detection and stability on mineralized soils. But keep in mind that these coils decrease the pinpoint mode accuracy, add load to the bar and increase energy consumption. Garrett Ace 250 has no volume regulator. While I can’t call it a problem, sometimes it is really too loud. The simplest decision here is to cover the loudspeaker with a sticky tape. Or it is reasonable to actually use headphones with volume regulation – you will hear the signal better, and will also save battery charge. When the batteries discharge, Garrett Ace 250 starts sending false signals. You can consider them accurate being unaware of the problem. But if you put the metal detector into the air, it will still give you signal, meaning that it is time to recharge the tool. 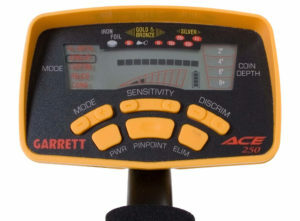 In addition, when the batteries are half-discharged, ACE 250 starts to lose its depth of detection (in about an inch). At the end of the day, Garrett Ace 250 has never been broken during my two years of using it actively, despite the fact that I never watched it specifically, and it was often given to other people. It does bring finds. If one happens to research in places of WWII battles, it is really fantastic, I managed to find coins, mostly, sometimes even the Roman Empire items. The tool performs fine with other coils. On salty sand (I have researched on the beach) you can prospect, too, but have to get used to small false signals from time to time. But the most important thing is, after I have tried out different metal detectors, I still like my good old Garrett Ace 250. If I happened to be a newbie right now, I would have myself recommended this best budget metal detector to myself. With Garrett Ace 250 you will be confident in its reliable structure and simplicity of performance. This best metal detector has the widest range of coils compatible with it (there is no other metal detector with the same quantity of options). You will always have finds. And after you decide to level up with your metal detector, you will always be able to sell your Ace 250 in any condition, as it is the most demanded model of used metal detectors.